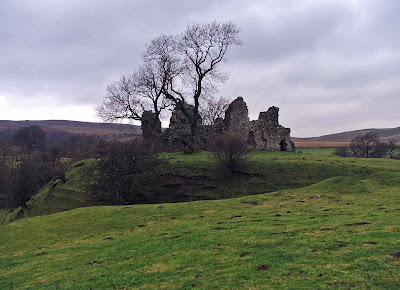 The remains of Pendragon castle lay about 5 miles to the South of Kirkby Stephen, on the B6259. The road winds its way along the bottom of Mallerstang valley with the river Eden at its side, and the spectacular Mallerstang Edge cutting the skyline to the East of the castle. The valley is home to three main fortified buildings: Lammerside Castle, Wharton Hall, and, most spectacularly, Pendragon Castle. 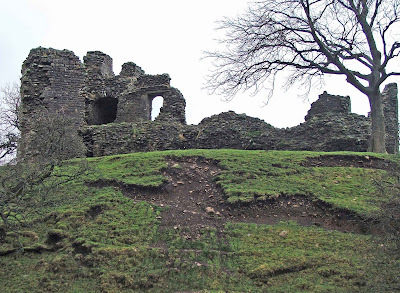 The remains of the little castle, sit on the summit of a small spur of land that juts out over the river Eden below it. 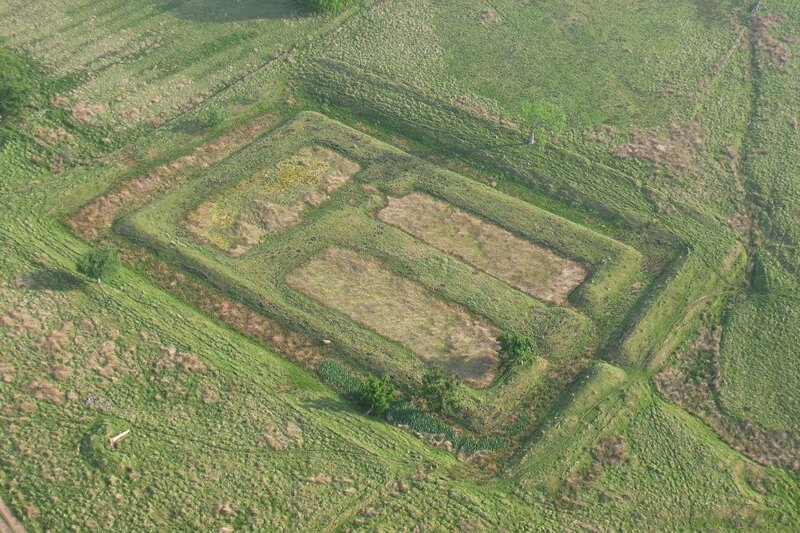 The earthworks stand to around 12 metres high, with the solid remains of two causeways breaking the ditch that encircles the castle. Indeed, the ditch\dry moat that runs around the castle is around 3 metres deep and some 7 metres wide. 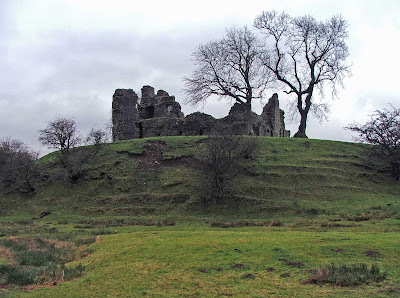 Legend has it that Uther Pendragon, the legendary eponymous builder of the original castle, tried in vain to redirect the river Eden into the castle’s moat, but failed at every attempt. The masonry remains are quite substantial, but what has been lost along the way is even greater. The walls stand to between 2 to 4 metres thick in places, demonstrating the defensive capabilities of the building, and still stand in places to second floor height, but mainly to ground and first floor. The third and top storey of the castle has long since collapsed, mostly filling the interior with rubble. It is this masonry ‘rubbish’ that forms the floor over which you have to clamber once inside the castle walls. The interior of the castle would have been partitioned off into smaller rooms, both at ground level, first floor, second and third floors, but all interior\dividing walls have long since been dismantled or have collapsed. Much of the outer stone cladding has been removed over the years, possibly for nearby buildings, but probably on the instructions of previous owners for more substantial and regal buildings elsewhere. The castle is thought to date from the latter part of the 12th century….possibly from around 1173. Hugh de Moreville is thought to have had ownership of the original castle, from around the late 1170’s or early 1180’s. What part of the remains represent this early castle is hard to tell, but the remains are substantial enough, and diverse enough to suggest that rebuilding, renovation and expansion have been an ongoing part of the castle’s history. 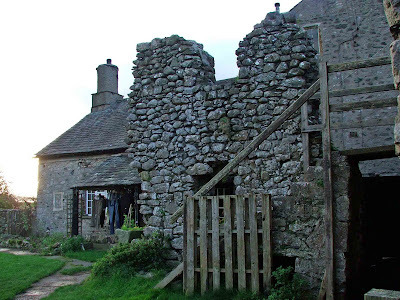 Documentary evidence exists telling us that the castle was restored to the ownership of Hugh de Morville’s nephew, Robert de Vipont in 1203, with ownership then passing to Robart de Leyburne in around 1269. 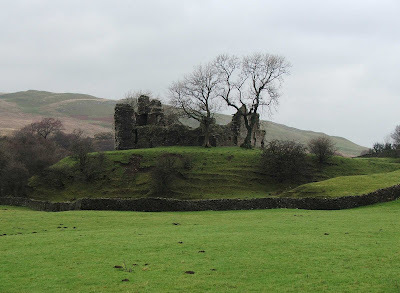 When de Vipont died in 1283, the castle was mentioned in documents as ‘the castle of Mallerstang’. For the most part, the castle we see today probably dates from 1309, when a licence to crenellate the tower was granted to Robert de Clifford. The licence was granted by Edward II, and was probably as a result of a request by Robert in view of Scottish attacks on the area. 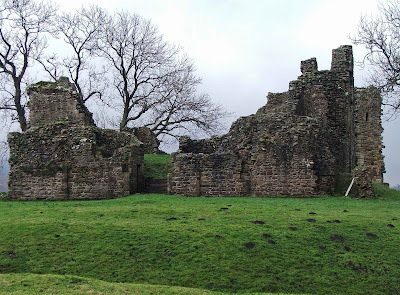 Ownership of the castle was forfeited by Roger de Clifford to Edward II, when he was captured by Edward’s army at the battle of Boroughbridge. However, ownership was restored to the de Cliffords in 1323. 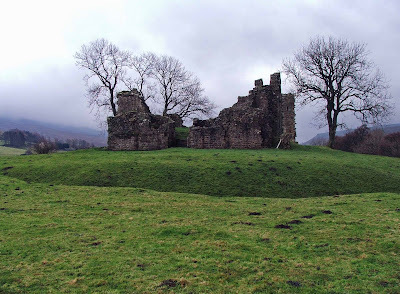 An attack on the castle in 1341 by the Scots, caused so much damage, mainly by fire, that it was largely abandoned until around 1360 when it was rebuilt and extended. The corner turret that stands out from the South West wall, was probably built at this time, by Robert de Clifford. The castle remained inhabited until 1541, when a fire again damaged the castle beyond repair. 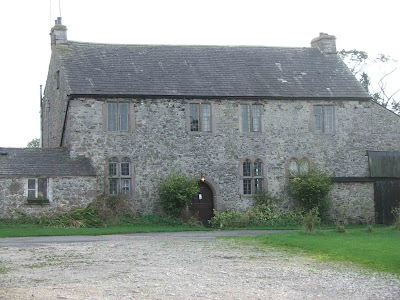 It wasn’t until 1660, that it was restored again, this time by Lady Anne Clifford. 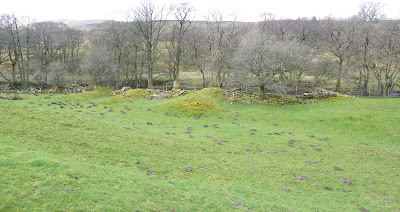 The inconspicous mounds of earth shown in the first photo of this post, may represent the remains of the footings\foundations of stables built by Lady Anne Clifford. The castle enjoyed over 20 years of care and attention, until it was partially dismantled in around 1685, by the Earl of Thanet, Lady Anne’s successor. 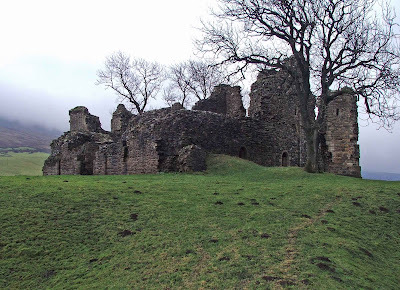 The castle was superfluous to requirements, and masonry, lead and timber were removed and used in the upkeep mainly of Appleby Castle. Today the castle sits in a quiet and remote part of the Cumbrian fells, with hardly any passing traffic and only the odd walker for company. Although it’s sited on private land, access is allowed. The surrounding field, moat and the interior of the castle are fully accessible. The only known remains of Burton Hall in Warcop, possibly a fortified manor house, now lay in the church yard of St Columba in Warcop. They conisist soley of a small portion of a window, and a doorway. 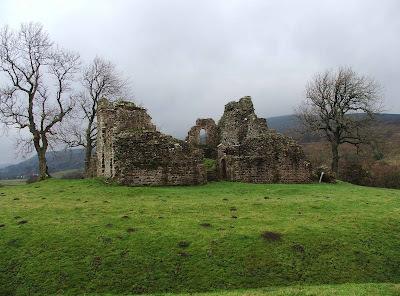 We know that the hall and the family that owned it were important in the area, as St Columba's had a Burton Hall chapel, as well as a chapel for the family from nearby Warcop Tower. Above. The surviving doorway now in the church yard of St Columba. The hall was situated in what is now the Warcop training army training area.....marked on the map as a 'Danger Area'. On the day I visited, tanks and machine guns could clearly be heard. Above. Aerial view of the fish ponds, courtesy of Simon Ledingham. Why the remains of the window (which I couldn't find) and the doorway were moved here, and not kept in the hamlet of Burton, I do not know....but the remains are an indication of the ornamentation instilled in the hall, and that has now obviously vanished. 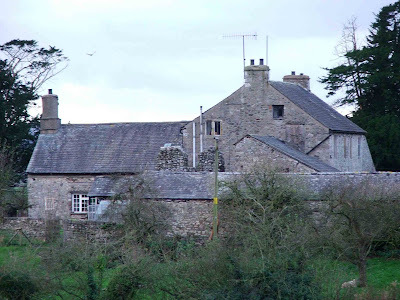 If you venture out to see the church at Warcop, the doorway is hidden in the undergrowth to the rear of the church, and backs onto the driveway of the old vicarage.